This entry was posted on 5/18/2016 10:30:00 AM and is filed under Bernie Sanders . You can follow any responses to this entry through the RSS 2.0 feed. You can leave a response, or trackback from your own site. You sure your not mixing Bernie up with Ted Cruz and right-wing religious values and culture warriors? Last time I checked socialist programs like Social Security and single payer healthcare systems like Medicare are still pretty popular. What besides the Westboro Baptist Church proclaiming that gays are the reason solders die in war, are the other popular ideas the religious right and culture warriors came up with? Conservatism is all about fossils. Do you seriously think trickle-down economics, interventionist foreign policies, and the blatant discrimination against the other aren't ideas that are as old as the dawn of time? The concepts of Marx, Engels, the New Deal, a strong middle class, of liberty, equality, fraternity, the so-called Nordic Model of social democracy -- those were just a relatively new blip on the radar screen. Better believe the plutocrats and their henchmen have been trying to put a stop to THAT. 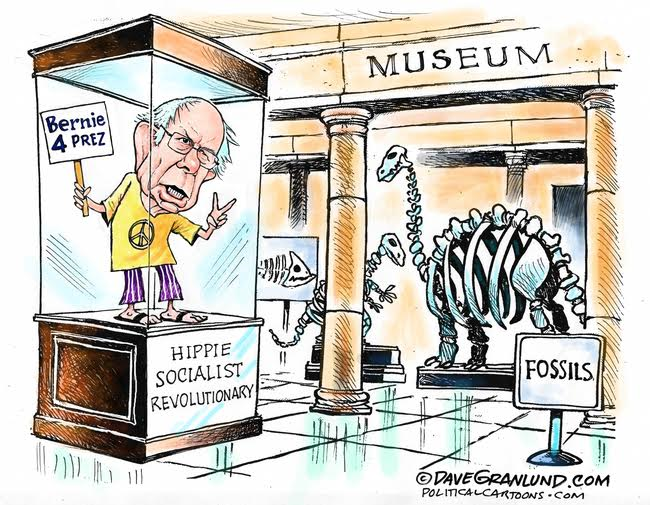 Right wingers wish they could label Bernie's ideas fossils. But the younger generation has no reason to love our current iteration of free-market capitalism. Today's economic policies have failed the new generation and the old-- but the right just thinks illegal Mexicans and terrorism are the reason they can't get ahead. I highly recommend the cover story in May 23 Time magazine by Rana Faroohar "The Markets are Choking our Economy." Jezzuzz Christ on a bike: Talking about barking up the wrong tree. Perputually irate reactionary conservatives circling the wagons and desperately coagulating inside their ever shrinking bubble: Now THOSE are some fossils. I do believe that is fox news' base. If Sanders is labeled a fossil, then I'll be proud to join him with that label. What good have so-called "conservative" ideas and policies brought us over the past 40 years? All I see are a rapidly shrinking middle and working class, while the .001% has scooped up most of the wealth via insane tax cuts. This has left us vulnerable to the terrorists that rightwingers so love to shriek about because of our failing infrastructure and lack of controls over them - due to an ever decreasing tax base. If seeking to strengthen our infrastructure, make it easier for US citizens to get a decent education, looking for ways to make health care more affordable, while looking for ways to strengthen our economy is considered "out dated" or "fossilized," well: count me on it. This is the kind of propaganda sharted out by rightwing think tanks to encourage conservatives to vote against their own interests. What does Donald Trump propose to do: why lower taxes on the wealthy, of course. That would be the Number One thing he'd do upon entering office. Yeah, Trump's ideas are just so cutting edge. Just finished Foroohar's article. Excellent stuff, thanks. Bernie isn't a fossil because he has antiquated beliefs; he's a fossil because he's older than anyone who has ever been elected to the presidency by roughly half a decade. That doesn't let either Trump or Hillary off the hook, though. They're both Reaganesque in age, and we all remember how badly things worked out when that senile old man was in office. They're all too old. Younger candidates, please.